This TEMPbadge™ expiring badge front combines with the appropriate badge back to create a full expiring badge solution. When the two pieces are combined, this badge will show a series of red lines after a half-day, preventing the badge from being reused. This red lines provide a clear visual indicator that a badge is no longer valid, helping to maintain security on site. 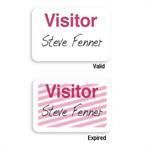 Variable visitor information like a name or the date is key to any visitor badge. This expiring badge front makes personalization as simple as can be: data is written on the badge front using a pen, pencil or marker, eliminating the need for a printer or other accessories. This badge front features a printed "VISITOR" header, allowing a visitor badge program to serve as a role-recognition program as well. 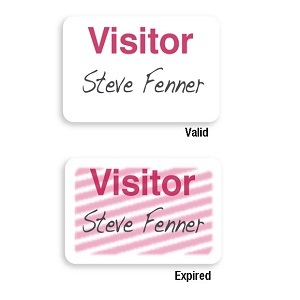 Our two-piece expiring badges are a secure, easy-to-use Visitor Management system that will be effective at sites of all kinds. When combined with the badge back, this badge front is the perfect visitor badge for government offices, colleges and universities, medical centers and more.